A big congratulations to all the participants of our Employability Skills Training program in getting offered an exciting internship with Optus Stadium! These students began the program three weeks ago under the direction of our hospitality trainer, Maryjane, and gained a comprehensive introduction into working in the hospitality industry. With weekly visits to the stadium, the program allowed students to think critically and problem solve throughout a series of real world tasks. 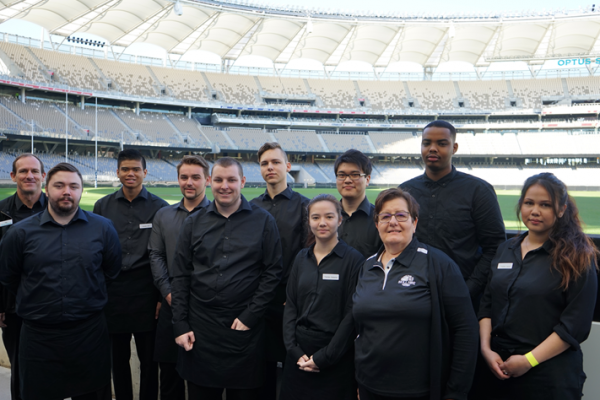 This new government initiative saw Skill Hire work directly with Optus stadium to train and prepare the students for a career in hospitality. Upon completion of the three week course, participants have the potential to be offered an internship and in certain cases, full-time employment! We have no doubt that these talented students will have a bright and prosperous future in the industry and wish them the best of luck for their internship, congratulations everyone!